This just in: I have high blood pressure. Not to be confused with my blood pressure being high. I officially have hypertension. That's right, 23 year old me. 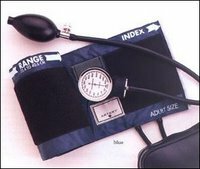 I went to get my yearly on Wednesday (December 14) and as doctors are wont to do, mine checked my blood pressure. It was high, (130 / 110) but your blood pressure goes up when you are in a new place for the first time. They checked it again after my "inspection" and it was even higher. Three more checks resulted in an average blood pressure of 170 / 105. The doctor prescribed Diovan - to be started immediately. I'm also going back for some blood work to make sure nothing else is broken. I suppose I shouldn't be surprised. My dad was diagnosed with high blood pressure when he was 25. My mom developed it after she got Multiple Sclerosis. Other than genetics, I have most of the known risk factors. This begins a new chapter for me. I do not want to be on medication for the rest of my life. Plus, it's scary when a doctor seems convinced you are on the brink of a stroke. After talking to him, I realized I had warning signs. I though the headaches were dehydration, the fatigue normal, and that the blurred vision wasn't really there. At my age who thinks these are signs? Not me. So. From now on it's more exercise, less salt, more vegetables, less saturated fat, more fruit, and less red meat. HA! That last one is a trick - I don't even eat red meat. I'll let you know if I have a stroke.